WHAT IS MULTISPORTS ORANGE COUNTY? 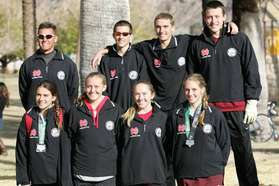 Multisports OC offers the highest level of coaching, technique instruction, and training for swimming, cycling, running, & triathlons. The program focuses on helping athletes improve and enjoy the process of training to reach personal excellence in competition. The club's motto is "Practice with Purpose" and emphasis is placed on learning to do each sport correctly, before training harder, to ensure injury free participation and longevity in sports. Once efficient biomechanics have been taught, the focus changes to heart rate management, pacing, and sound periodization training principles to continue to help athletes get faster. We strive to "Leave No Stone Unturned" in helping people reach their personal performance goals. This involves helping athletes improve and be congruent with all aspects of their lives to be healthy, fit, and relatively stress free. We do this by using a network of fitness professionals with expertise in Technique, Training, Strength/Flexibility/Movement, Nutrition, and Injury Prevention and Rehab. We want athletes to "Strive for Personal Excellence" instead of just "Suffering to Finish."